The majority of home owners have no idea about the importance of a furnace. Most homeowners would not even know where the furnace is located or how it works. The one time that most people realize how important a furnace is when it breaks down right in the middle of the winter. The chief reason why there is a need for furnace repair in the middle of winter is because it most likely has not been well maintained. Secondly during mid-winter the furnace is usually overworked and may break down if it has not been regularly maintained. 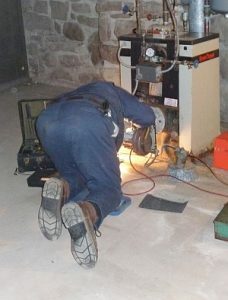 Almost every day in winter, one can see Emergency 24 repair furnace repairs being done in a home. HVAC trucks are also common on the road rushing to homes, indicating that furnace repairs are ongoing. What homeowners fail to realize is that during peak winter, HVAC professionals are fully booked because of emergency cases. Thus, if your furnace breaks down during winter you will have to wait a few days or even weeks to get emergency furnace repairs. Only a few HVAC companies have qualified technicians available 24 hours. To prevent the chaos and misery of winter that occurs when your furnace breaks down, it is highly recommended that just prior to winter you have a professional HVAC technician look at your appliance and make sure it is okay. Having furnace repairs on an emergency basis can also prove to be costly. To avoid hassles, always have the name of a reputable HVAC company on hand, so that you can call them if there is an emergency. Most people have no idea who repairs furnaces and then search the yellow pages or the Internet. This all takes time and in most cases the people selected to repair the furnace are fly by night operators with little experience. To avoid being ripped off, get in touch with a reputable HVAC company and speak to them about winter maintenance. These companies have qualified technicians who are up to date on the latest appliances and cost a lot less than having to repair the furnace if it breaks down in mid-winter. Because there are very few HVAC companies which offer 24-hour Emergency Furnace Repairs you must have their names listed so that you can reach them if you have a problem. If you have a furnace, the best advice is to avoid breakdown of your appliance in the first place. Have it regularly well maintained each year. We offer professional technicians who can come and assess your machine and ensure that it is in good condition. It is better to replace an inefficient machine before winter than having emergency finance repairs in mid-winter, which is not only expensive but will leave you without heat for a few days or even weeks.